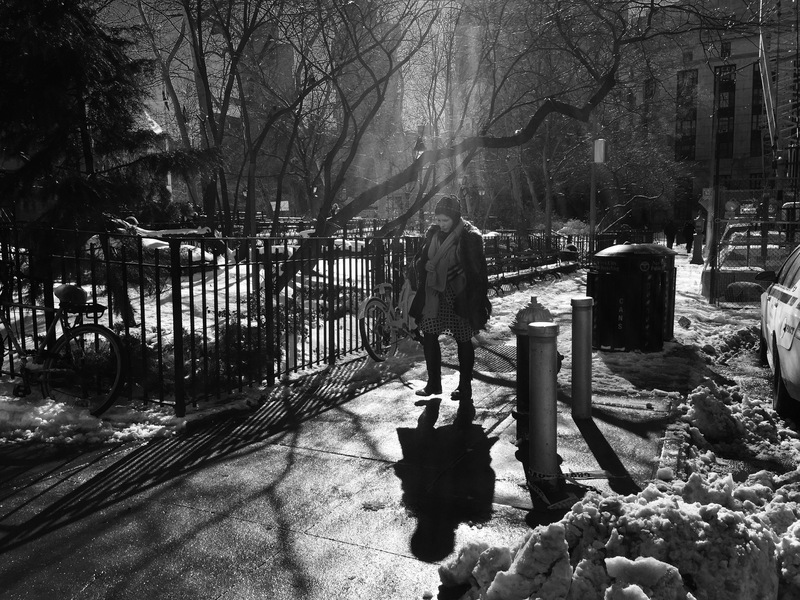 Walking through the sunshine of winter here in NYC. . .
Beautiful pic. 🙂 Are you in a graveyard? No gh0stpupp3t, not in a graveyard, not that I know of anyway! That’s so good to hear, thank you Tex!! Sooooo evocative, pensive, slightly eerie and other worldly. My imagination runs riot looking at this! Full of excitement. Neat and interesting. A lot to see. A little snow, a lot of clutter . . . thank you Antonia! Fabulous Patti. What a light! Thank you Bente, fun in the midday sun! The girl is sunk in thought. What is her mind conjuring up? A poem or planning tonight’s dinner? I like this photo very much. Despite the snow it feels warm and intimate. Thank you Gerard but I have enough trouble remembering my own thoughts and dinner plans! Thank you so much Joe, more to come this week? Really captures the atmosphere perfectly Patti……well done! Thank you so much Burgess, don’t you just miss such winters! A moody piece. Love it Patti! I absolutely love the lighting in this shot Patti. The sun doesn’t seem to be spreading much warmth – your lady pedestrian looks rather down. Like an evening in daylight! You do create magic! With the rays of light and her foot in the air, is she climbing the stairway to heaven? Fantastic capture of mood and light Patti. Love it!